‘Since the creation of the world, what has been more miraculous excepting the mystery of the Cross, than what has happened in modern times in this journey of our Jerusalemites?1 Ever since this extravagant conceit of Robert of Rheims, failed abbot and popular historian of the First Crusade, written some time before 1108, appreciation of the significance, nature, even course of such expeditions and of the importance of the attendant religious, social, political and fiscal mechanisms has depended on interpreters, not witnesses. Most medieval written primary sources were exercises in interpreting reality, not describing it. Even before the transmuting interests of modern historians operate, the record of the past is slanted. 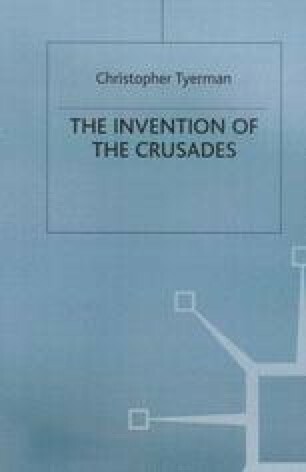 Thus perceptions of the First Crusade were created by the historians it inspired as much as by the experiences of those who campaigned. The actions of the latter were set in a precise, explicable context by the former. Not for the last time, the deeds of soldiers were explained to them by non-combatants. The sources, charters as well as chronicles, tend to be self-conscious attempts to explain actions and events according to the intellectual fashions of the time. The First Crusade united observers in astonishment, admiration and awe.